3 controls - Tone, Filter, and Drive - to customize your tone. Tone sets the brightness level, Filter dials in the high frequency response, and Drive determines the signal gain. 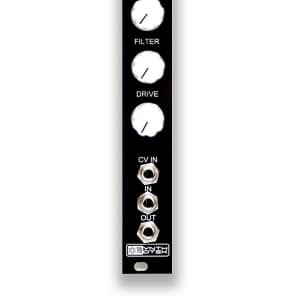 4 Diode Settings - An on-board 4PST DIP Switch selects between 4 different clipping diodes to drastically alter your sound. 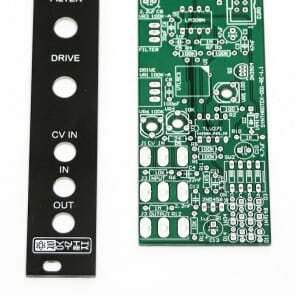 Turn on the stock version 1N4148s, LEDs, Germanium diodes, or none at all with flick of a little switch. 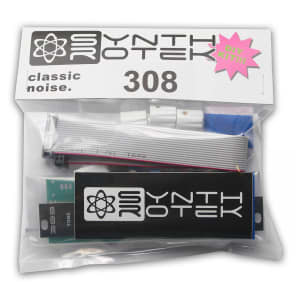 Vintage Tone - The PCB is designed from the original RAT tone IC, the LM308 single op amp. Guitar AND Modular - Adjust the input impedance with a trim pot. Plug your guitar in using Circuit Abbey's Axis module.